Tagged with " 3D scanning"
Perceptron, Inc. has spent the last 20 years pioneering and refining the use of laser scanners for applications on portable, and fixed, coordinate measuring machines. Now with the ScanR, what the company calls the world’s first green CMM laser-line scanner, Perceptron says they’ve built a device that extends the dynamic range for measuring reflective surfaces and carbon fiber parts. While photo booths were created and marketed as a way to preserve a moment in time at a place or event, the actual act of everyone cramming into the photo booth, laughing and hamming it up, is often the memory itself. With 3D scanning, that’s even more so the case, as Artec 3D offers us not only the chance to have full-body scans performed in their Shapify booths (memorable indeed), but they’ve also put the 3D scanning capability right into our hands—and powerfully so—with both the necessary software and hardware. A group at Northwestern University near Chicago is developing a new type of 3D scanning technology that should increase reliability and usability. Motion Contrast 3D Scanning Teaser from compphotolab on Vimeo. 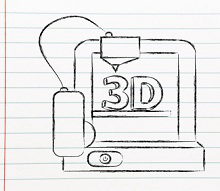 A brief intro to our Motion Contrast 3D (MC3D) scanning technology. Real-time 3D scanning is important for systems that operates outdoors like self-driving cars or augmented reality glasses. Current scanning devices fails when external light sources, such as the sun, are too bright. Our MC3D technology overcomes this problem to enable live 3D scanning in challenging conditions. Museums are among the leading lights in discovering the power of 3D printing to translate history into a tactile, engaging set of objects for their patrons, and now the new permanent Egyptian exhibition at the Museum of Mediterranean and Near Eastern Antiquities (MOMNEA) in Stockholm is making the hidden details of Neswaiu’s mummy available in digital form. The company responsible for China’s first OTC stock offered in the 3D digitizing and 3D printing industries, Shining 3D Tech, says they plan to spend some $2.4 million to set up a wholly-owned US subsidiary of the company, while looking to raise $70 million in additional funding. The funding will be used to expand on the company’s M&A action, they tell us. Fuel3D, a developer of 3D scanning solutions, has signed a deal to place their SCANIFY handheld, point-and-shoot 3D scanners in retail locations throughout North America via WYNIT Distribution. We’ve covered some exciting news from Fuel3D recently, and this retail availability will only widen their reach.